Pasta with peas is one of the simplest dishes to make in Italian cuisine. 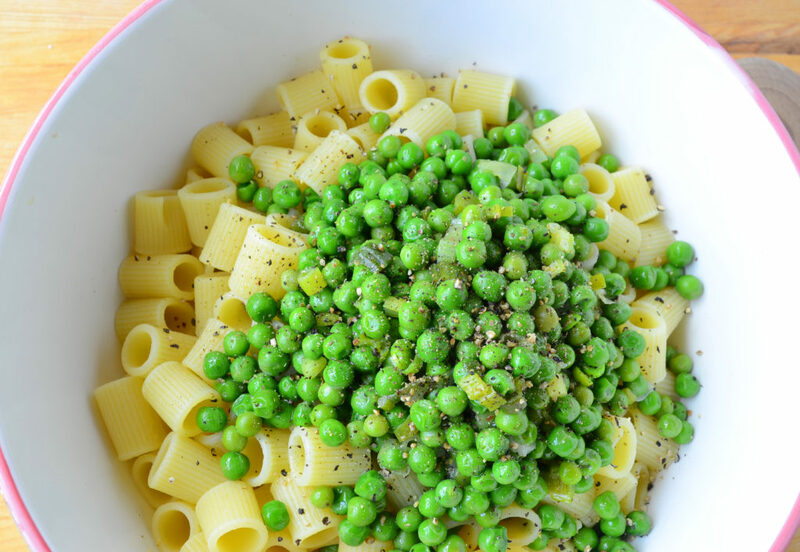 There is something earthy and comforting in eating a dish of pasta with peas. Forget about adding anything other than onion – like pancetta or herbs. I’m a purist when it come to my pasta and peas. Other ingredients tend to overshadow the taste and sweetness of fresh spring peas and onions. Spring onions have a slightly bigger bulb than green onions or scallions and are milder in flavor than regular onions. If fresh peas are not available, you can substitute frozen peas and it won’t really affect the outcome. Honestly. Using the right type of pasta is important here. Ever try eating spaghetti or penne with peas? The peas tend to either fall off your fork or slide around your plate. What you need is a pasta that has pockets to hold the peas in. Using a smaller pasta type, where you can pick up a spoonful of both pasta and peas without difficulty, also works well. 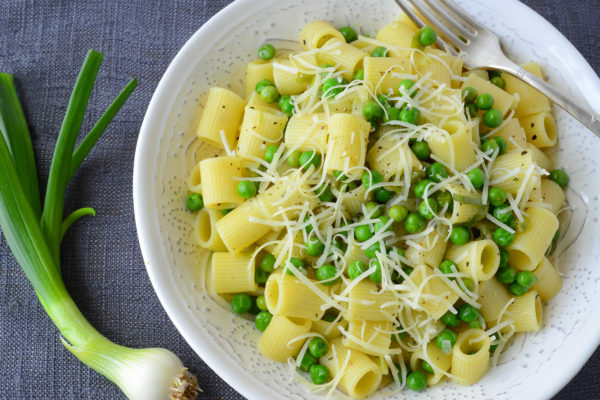 My favorite is Mezzi Rigatoni pasta because the peas get caught up in the middle of the pasta making it the perfect receptacle. Most Sicilians use a smaller pasta like Ditali and prefer a soupier consistency when making this dish. Heat olive oil in a medium sauce pan over medium-high heat. 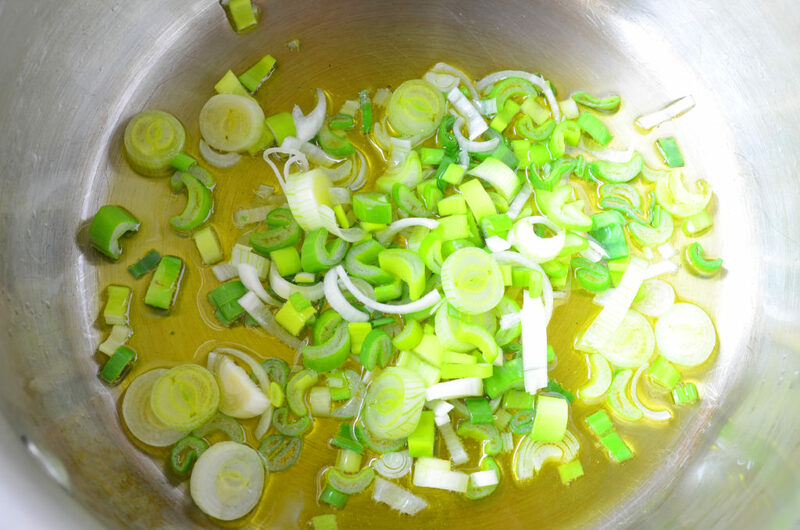 Add the spring onion and cook 2 to 3 minutes, until soft. If using yellow onions, cook 6 to 7 minutes. Add the peas and 1 cup of water. Season with salt. Bring to a simmer and cook 8 to 10 minutes, or until desired doneness. 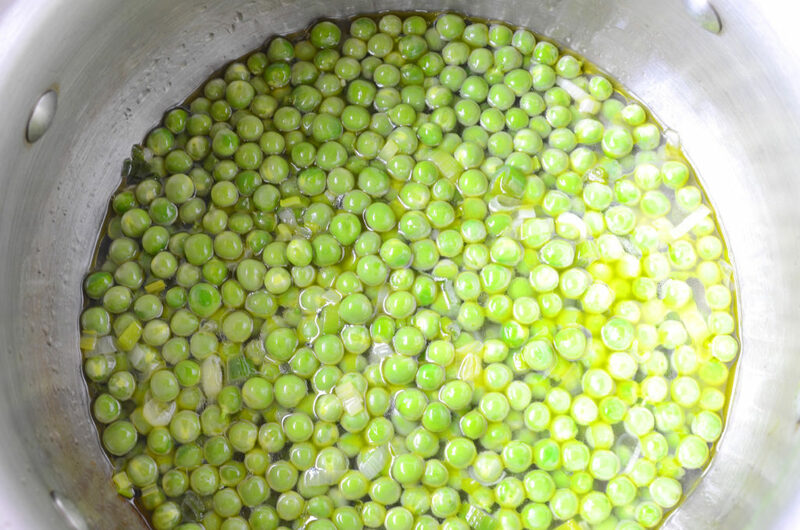 While the peas are simmering, add the pasta to the boiling water and cook to al dente. Both the pasta and peas should be ready at the same time. Drain the pasta, reserving 2 cups of the cooking water, and transfer to a large bowl. Do not drain the peas. Combine the pea/water mixture with the pasta. Season generously with fresh ground pepper. Add some of the cooking water if pasta seems dry or you prefer your pasta to be more soup-like. Place pasta in individual serving bowls, lightly drizzle with olive oil on top, and sprinkle with cheese.